• High rigidity, shock resistant metal gears. • Coreless Motor Design for fast speed, high efficiency, and low power consumption. • Higher signal resolution for smooth movements. • Fast speed with high torque of 9.0kg/cm. High strength composite alloy gears with durable structure characteristics. 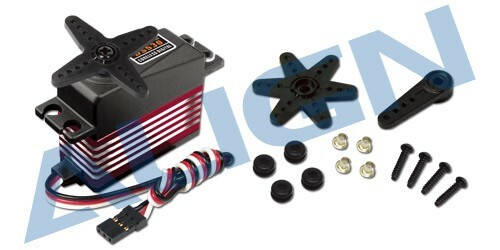 • Supports high voltage 8.4V. • Powerful and precise servo suitable for T-Rex 500 CCPM cyclic use.